GPSToday v0.99 freeware for Windows Mobile Phone. 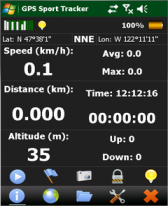 Summary: GeoTerrestrial GPSToday now brings an unbeatable combination of location features to your mobile device. UPDATED v0.9.9.7 Beta is available for download now ! Update your twitter status manually from within the GPSToday app. Just send a message to username 'twitter' via the Inbox in GPSToday. 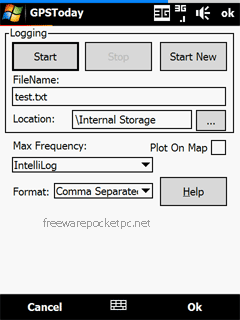 Upload your GeoLogger log files from within the app and view on desktop and export to GPX format on your online GeoGroups page. If you already have version 0.9.9.7, you do not need to update your installation of GPSToday to access the above 2 new features. 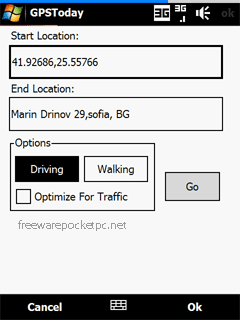 Driving/Walking directions in many countries, with traffic-optimization option. Location Tracking and sharing (GeoLocation). Track your location history online for your own private use, or share with friends/family. The power-saving ability of GPSToday means you can leave it on indefinitely without worrying about the battery. Easily and privately (or publicly) share points-of-interest, pictures, messages with like-minded folks (GeoGroups). eg. Track or update swine-flu locations, right from your phone. The possibilities are endless. Satellite,Hybrid map views, and many more enhancements for ease of use. Nearly worldwide support for many features that were previously US only. Essentially the works, all in a still small package. More features are listed below the screenshots. 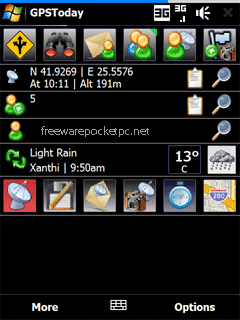 This software will not work on OS older than Windows Mobile 5.0 versions, or on any non-touchscreen smartphone. Data plan is recommended for online map features, but not necessary for offline features like geologging or geotagging. 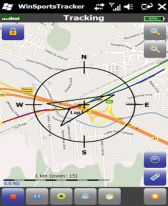 An Integrated GPS is advisable (but not mandatory) to fully enjoy the software. 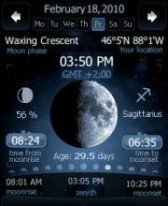 It utilizes intelligent algorithms to always maintain and display a fix on your position right on your today screen, without draining the battery. Always see your full street address, not just geo-coordinates. 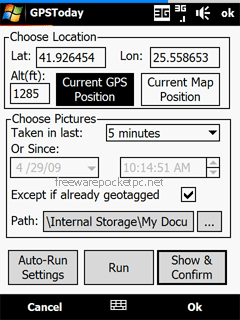 GPSToday always shows the distance to the nearest contact from your device's address book. Single tap to create a new contact with your current location as the address, or save the current location as an existing contact's address. Imagine not having to type the full street address on the PPC keyboard! You will never need the stylus to use GPSToday! 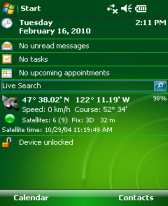 Speed, heading and satellite data is shown clearly on the today screen whenever the GPS is running. In-pocket tap protection. 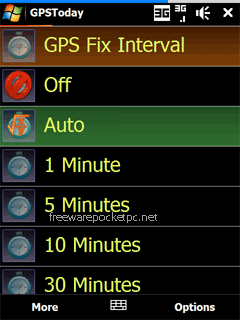 A single tap on the today screen only operates the GPS in quick fix mode. To fully start the GPS in continuous mode requires an iphone like sliding motion, guaranteeing no pocket accidents. Single tap from the today screen to access fully draggable online maps! Always see all your address book contacts on the map. Just tap a contact to quickly call/email or send sms. Single tap from today screen to quickly do a yahoo local search around your current position and see the results on a live map. Just tap a result to call or open the website. High quality Yelp Reviews for local search results! Fetch the full street address for any point on the map. GPSToday automatically disables data access when your device goes into roaming mode. New! 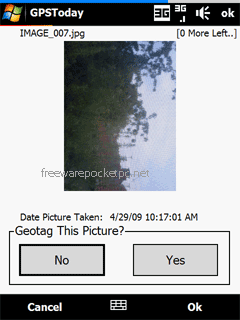 Install the GeoTagger add-on to have pictures automatically geo-tagged with current location! 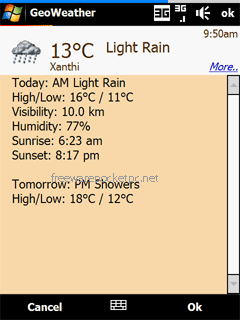 You can also manually geotag single or sets of pictures by selecting the desired location on the map. Hey all, you can now download the GeoGroups iPhone app at http://itunes.apple.com/us/app/geogroups/id379847494?mt=8 or just search for geogroups in the appstore. I have a HTC TOUCH 2 and it worked perfectly! great software! worked great on first install on my HD2. But after a hard reset and reinstall, can no longer use it due to authentication errors that I cannot get to go through.